I am growing increasingly interested in old pictures, and often I imagine myself being there in the times captured in them. The nostalgic moments I spend with old pictures add fourth dimension to my life. Cameras made it to Bhutan in 1907, evident from coronation pictures of first King but we hardly have more than few pictures until recently. We had painters as far as history stretches but they have never tried anything other than religious and spiritual symbols. 1783 Wangdue Dzong- only difference visible is the rounded edge of the walls. 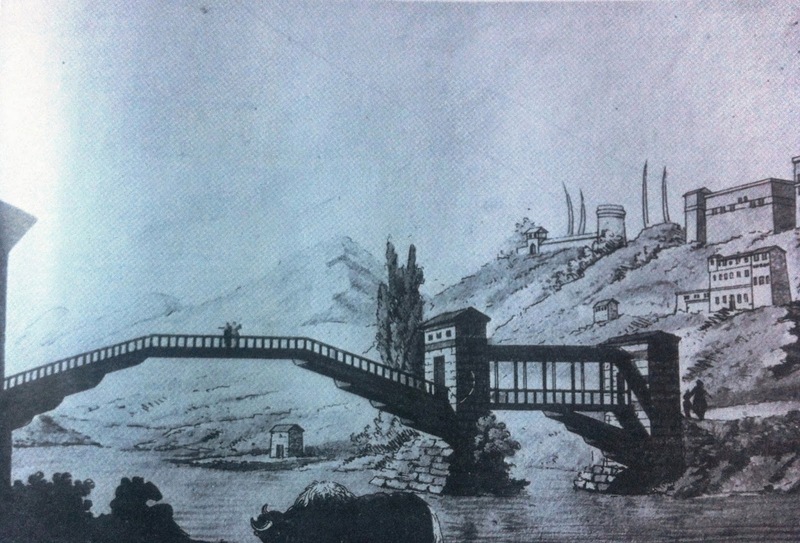 But in 1783, Samuel Davis, lieutenant in the Bengal Army, joined Samuel Turner's Mission to Bhutan and Tibet as draftsman and surveyor has done us a great favour. It's only through his painting and journals that we can look back as far as 1783 into our history. And it's of course Michael Aries who gave us the access to these rare picture in his 1982 book "Views of Medieval Bhutan". 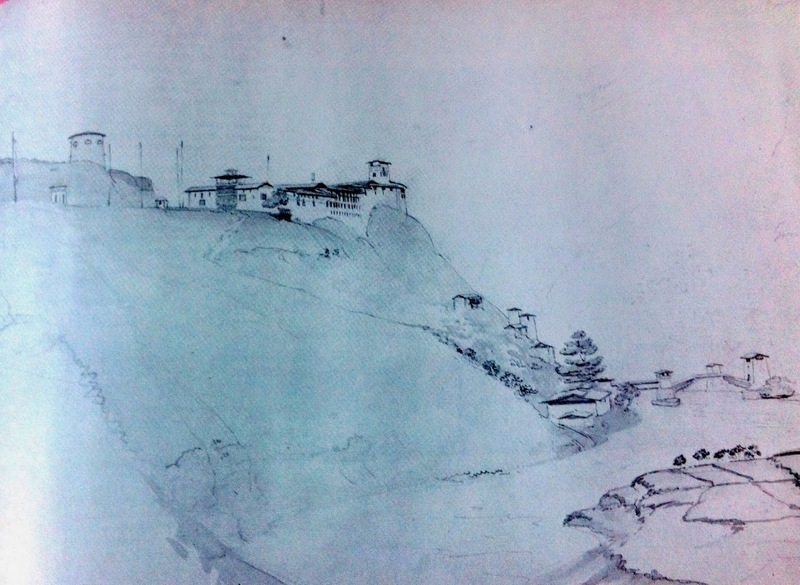 Of all the pictures in the book I am awed by the paintings of 145 year old Wangdue Dzong. 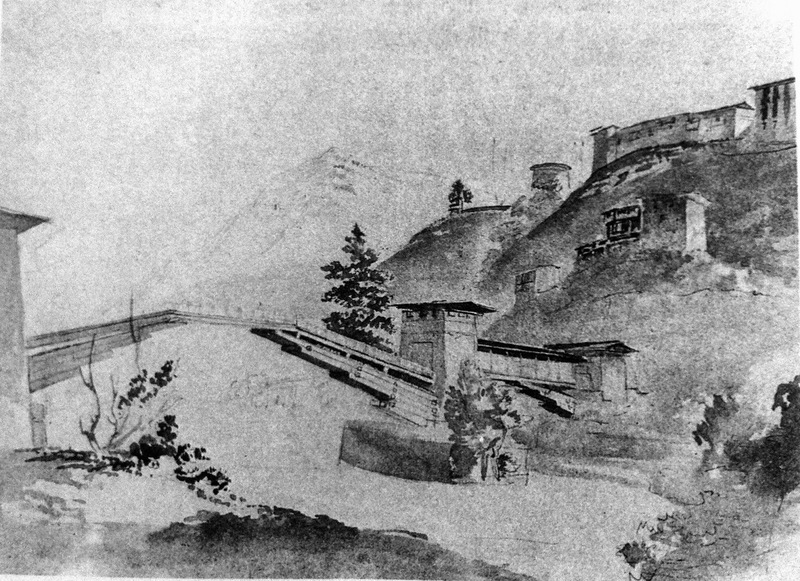 In 1783, the dzong Samuel Davis painted was the original Dzong from Zhabdrung's time because in 1837 it was destroyed by fire. 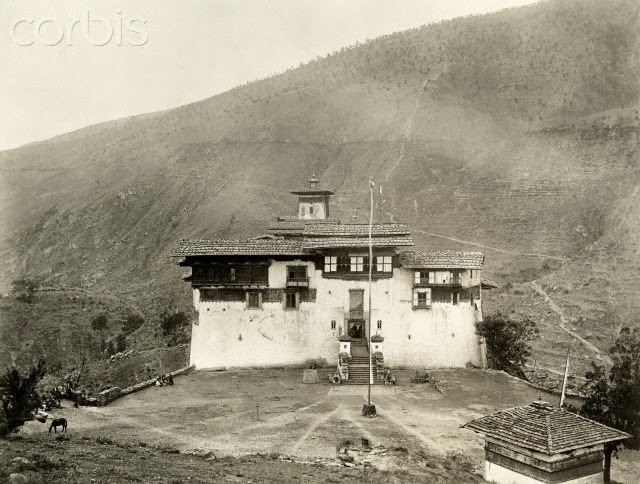 And later in 1897 the dzong was again destroyed by a severe earthquake. Thus, the dzong we saw before 2012 fire was not actually from Zhabdrung's time. 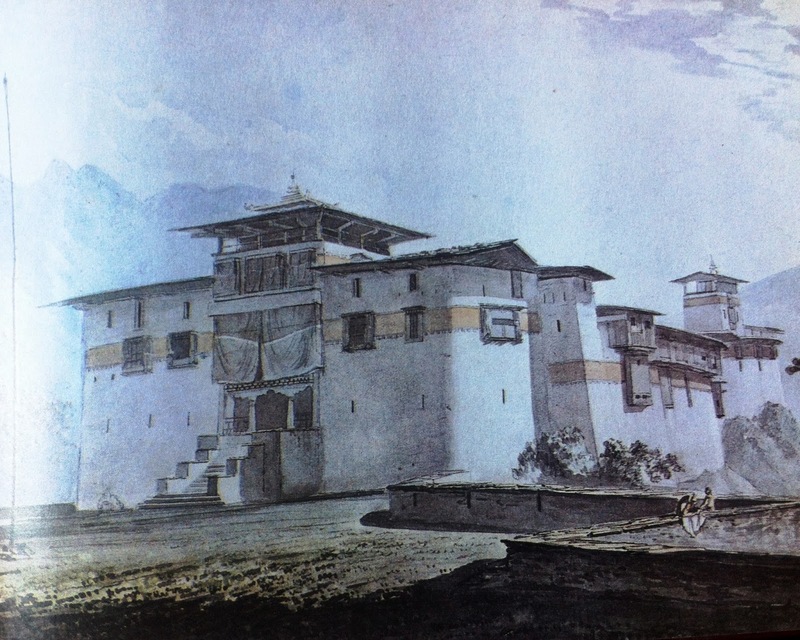 But from Samuel Davis's painting we could conclude that the Dzong has always maintained its original Zhabdrung architecture despite two big disasters. 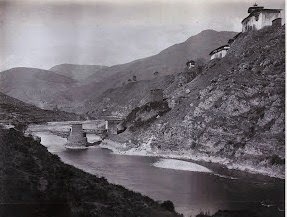 The tower bridge that was very unique was a big compliment to the magnificence of Wangdue Dzong, any old picture you see of the Dzong would have the bridge in it. It's as if the bridge was part of the Dzong. Wangdue Zam even fascinated the painter Samuel Davis back in 1783 that he went on painting it thrice. 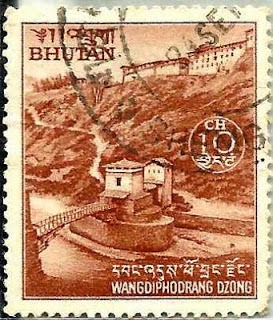 The magnificent Wangdue Zam stood bravely by the dzong until early 1970s. It was said that the bridge maintained it's original beauty and form until it was demolished to give way to motorable bridge. In 1783 paintings there were two things that weren't not seen during our times, not even in 1970s pictures- the village below the Dzong and the Ta-Dzong. I wonder what must have happened to the village to have completely disappeared, in fact the landscape has changed altogether that small patch of plane where once several houses stood is now the riverbed. What is the story of the Ta-Dzong. Paro and Trongsa Ta-Dzongs are intact but what happened to Wangdue Ta-Dzong? It must be located below Rada Lhakhang, where the new Dratshang was constructed. Even the foundation is gone forever now. Wangdue Dzong as Seen before 2012 Fire. Wangdue Dzong was undergoing major renovation when the unfortunate fire incident happened on 24 June 2012. To be continued. I have a picture from 1953 which went missing. You have gotten a good collection of the pictures of this majestic dzong. I hope you would trace back the picture from 1953 and post it here again. Great work.Had nice time going through them and would be looking forward for the missing pictures la.